On the Golden Jubilee Year of Indian Society of Western Australia (ISWA), in collaboration with Indian Associations, is organising the flagship annual event ‘Diwali Mela’ on 3rd and 4th November 2018 at Claremont Showground, Claremont. This event is alcohol and smoke free family event enjoyed by all communities. During the two days of the festival, there will be stage performances offering everything from Talent Hunt, Indian classical, Indian Folk, Bollywood dances, and variety of entertainment. The event includes food and market stalls, offering arts and crafts, fashion, financial services, spirituality, etc. In addition, there will be plenty of family-friendly activities such as children’s entertainment including Mechanical Rides. Spectacular Fireworks at 8:30 PM on each day. Trains stop at Showgrounds Railway Station. ISWA life members will receive free tickets. Please contact secretary@iswa-perth.org for member’s free tickets. Alcohol and smoking strictly prohibited in the event. Offenders will be removed from the event and no refunds will be made. Premier Tickets is an online event marketing and ticketing agency. 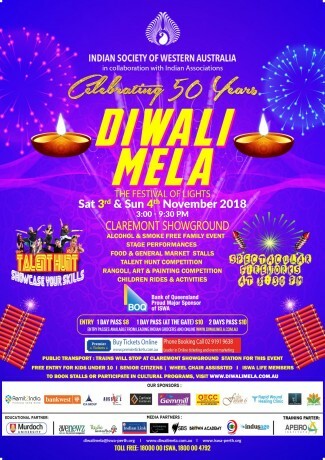 Premier Tickets will NOT be responsible for any changes related to the event schedule, artist, venue or cancellation and refunds related to the tickets for DIWALI MELA 2018 on 3rd and 4th November 2018 at Claremont Showgrounds, Claremont. 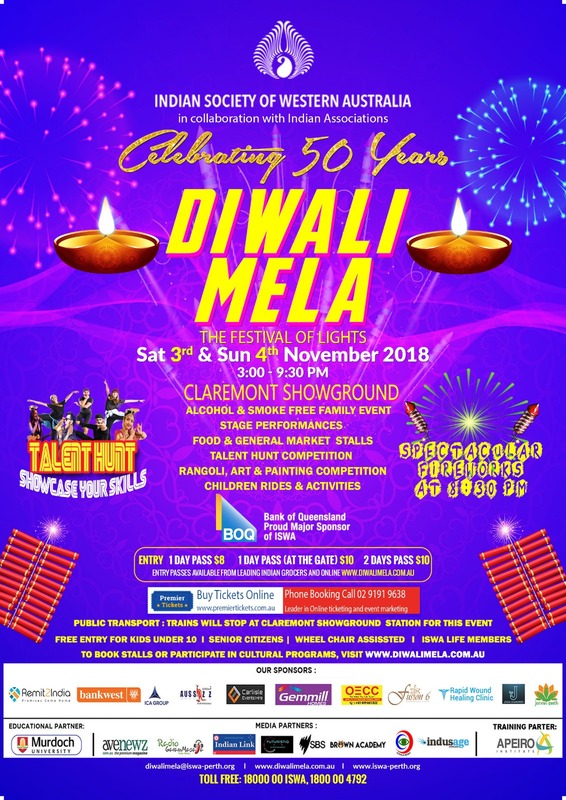 Premier Tickets Australia is proud to be the online ticketing partner for DIWALI MELA 2018 on 3rd and 4th November 2018 at Claremont Showgrounds, Claremont.